Japan’s National Institutes for Quantum and Radiological Science and Technology (QST) plan to install a Cray XC50 high performance computing (HPC) system at the Rokkasho Fusion Institute. The four petaflop supercomputer will be used for plasma physics (turbulence, edge physics, integrated modeling) and fusion technology research. 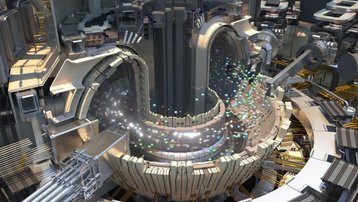 “We’re looking forward to delivering a supercomputer for QST that will further the Institute’s work in discovering opportunities for fusion power as a reliable energy source,” Mamoru Nakano, president of Cray Japan, said. The system replaces Helios, a 1.237 petaflop Atos/Bull system that was decommissioned in 2017. Japanese researchers have been temporarily using Italy’s Lenovo NeXtScale supercomputer Marconi, which is rated for more than 15 petaflops. The Cray XC50 will be used by more than 1,000 European and Japanese fusion researchers, and will compliment the ITER project, a 35-nation initiative to build the world’s largest tokamak - a magnetic fusion device that could prove the feasibility of a large-scale, net energy-producing thermonuclear fusion reactor. ITER is the world’s largest fusion experiment, being built in Saint-Paul-lès-Durance, southern France. It is designed to produce around 500MW of fusion power, sustained for up to 1,000 seconds, while 50 megawatts of thermal power is injected. But huge challenges remain, with ITER components often delayed and over budget. Assembly is expected to be completed in 2021, first plasma achieved in 2025 and the start of the deuterium-tritium operation is planned for 2035. Earlier this month, MIT researchers and private company Commonwealth Fusion Systems saw widespread publicity following breakthroughs they hope could bring nuclear fusion the market in 15 years.